Vintage ceramic Pansy ring is marked Made in Austria. 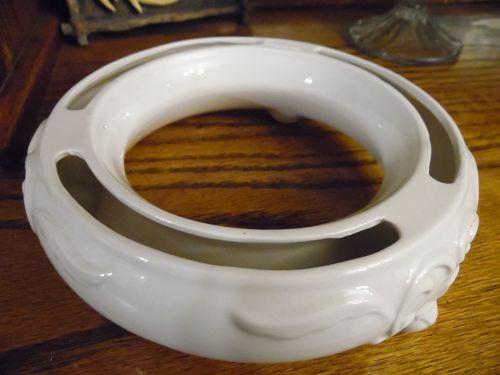 I have noticed this exact mold was also marked Goebel, and West Germany. A beautiful popular mold for sure. Measures 7 1/2" wise and sits on three fancy little feet. Ivory color and NO damages at all. Very sweet piece. 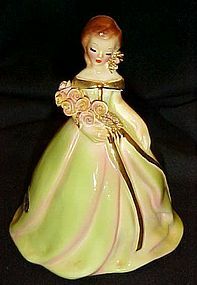 Early California Josef Originals(yellow) "Sylvia" a part of "The Little Woman" Series 6" tall. In wonderful condition. No chips, cracks, or breaks or crazing. No damage to her delicate hair decoration or the tiny petals on her roses either... Simply perfect! Has both stickers, Sylvia, and Josef Originals California sticker. Engraved Josef Originals on the bottom in mold. 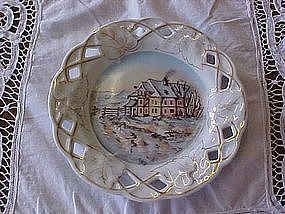 Very old hand decorated plate. Appears to be Germany. Has a green mark B S and the initial M under that, enclosed in a chopped cornered square, gold hand written number and an initial scratched in under the glaze. (see photo). 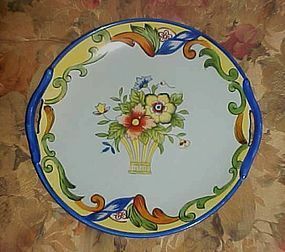 Measures 7 3/4" in diameter,and has all hand painted details. Scenery of a large homestead in the winter. Some relief detailing on the paint. Open lattice edges with leafs of gold. Nice condition. One tiny flea bite on the underside.